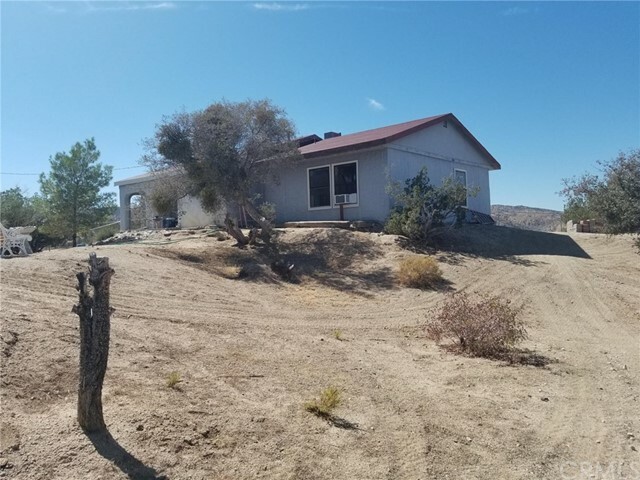 All Juniper Hills homes currently listed for sale in Juniper Hills as of 04/26/2019 are shown below. You can change the search criteria at any time by pressing the 'Change Search' button below. 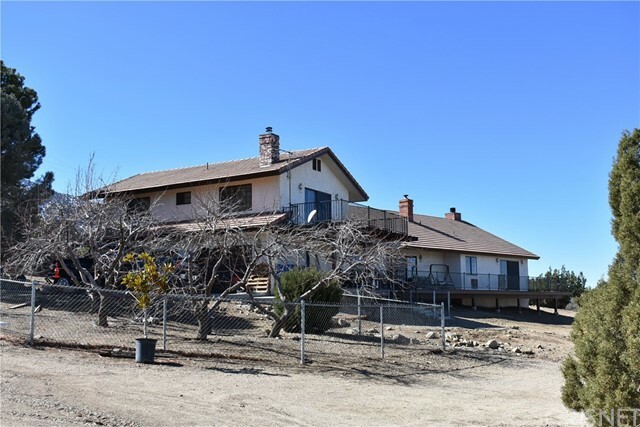 "11.6 acre Curly Horse Ranch (participant in 16 Rose Parades) includes APN #s 3059-019-037 and 3059-019-003. Excellent location in desirable Juniper Hills on paved road. 360 degree views of San Gabriel Wilderness Area, Antelope Valley and the Tehachapi Mountains. Custom ranch style home built for entertaining inside and out. Mature trees and native vegetation. Fenced with block/wrought iron, chain and farm fencing. RV access/garage parking and dump station. House is split into thirds to ensure energy efficiency. Each area has its own thermostat and heating/cooling units; (1) Main Master Suite, Kitchen, Mud/Laundry/Pantry Room; Office/Sewing/Craft room; (2) Entertaining Area - Living Room/Formal Dining Room/Entry Hall and Guest Bathroom; and, (3) Family Quarters - Second Master Suite, two guest rooms, bathroom. Also has heated outdoor pool with automatic roll out cover and indoor jacuzzi spa area. 66 solar panels (assumable lease). 900 sq.ft. guest house with detached garage and boat storage area. Attached 4 car garage and detached 4 stall RV garage. Has three producing wells. Custom 1,200 sq.ft. barn with rubber mats and horse runs. Lighted outdoor sand arena with concrete slab observation deck. Covered storage areas accommodate 720 bales of hay. Riding trail right off property. Many other horse amenities on the property. Property being sold AS IS. 6.7 adjacent acres being sold separately." 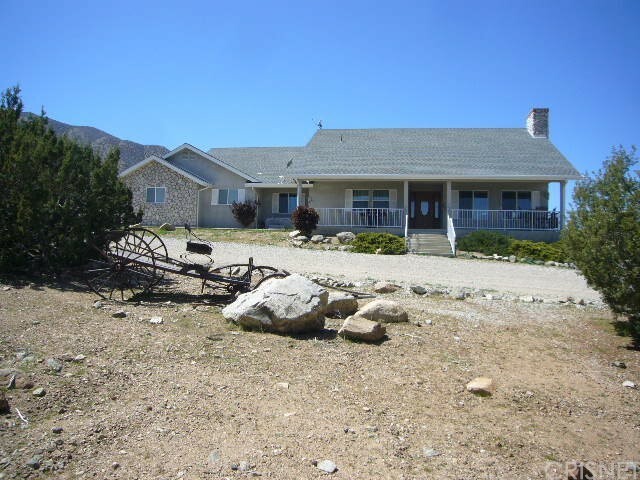 "Large custom horse property with gorgeous views in the Juniper Hills area in the mountain foothills. The main home is a 3+3, with over 3000 sq ft, a spacious living room with formal dining area, granite kitchen counters and breakfast bar, a family room with a great fireplace with insert, and a large master with a fireplace, separate tub & shower, and walk-in closet. Outside is a huge deck with panoramic views. Upstairs is a 1000 sq ft separate guest unit with one bedroom, one full bath, a freestanding fireplace, and its own kitchen. This unit also has its own deck for spectacular views. The property includes horse corrals, lighted arena, tack room & more. Just steps away from mountain trails." "Amazing HORSE PROPERTY with panoramic views! Two stall barn with tack and feed room. 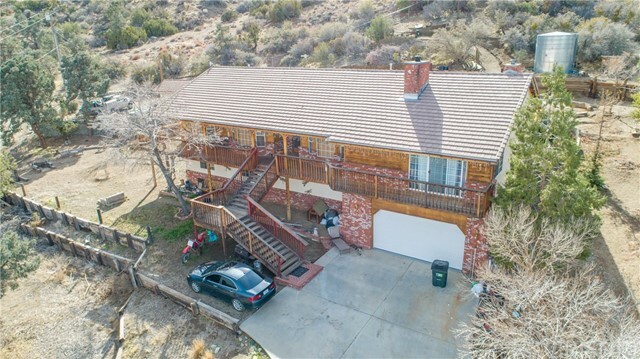 Custom built home complete with wrap around porch providing a breathtaking view of Antelope Valley, nestled on 1.5 acres backing up to the National Forest. Gourmet kitchen with new stamped concrete countertops. Large rooms. Stunning master bath with waterfall tub. Bonus unpermitted game room. Fully fenced with automatic gate, full irrigation system, 13 paid solar panels, enclosed pump house. MUST SEE!!! Propane tank included (not rented or leased), well water 11/GPM, wired for security system, has interior intercom and thermostat on WiFi." 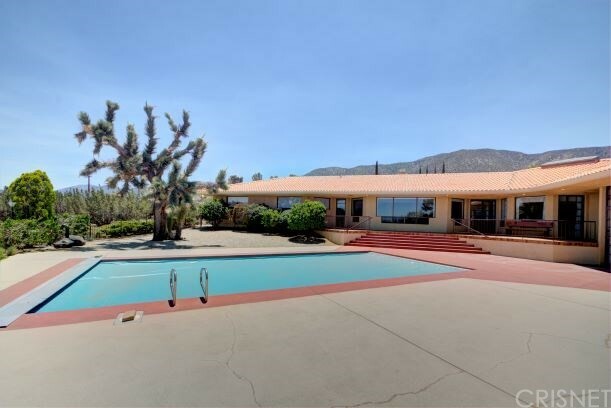 "Stunning 360 Degree Views From This Custom Home On Over 2 Acres*Extensive Concrete Including RV Parking And Driveway With Direct Access To Paved Juniper Hills Rd. *12x24'' Work Shop With 2 Roll Up Doors And Additional Shed*New 5,000 Gal. Water Tank*Pump House*Raised Flagpole*Exterior Of Home Has Cultured Stone With Metal Fascia, Also Offers Up Lights All Around The Home And Down Lights Across The Front*Covered Patio And Fenced Area For Privacy*Inviting Deck In The Front Of The Home*Double Door Entry Into This Open Concept Home*Formal Dining And Living Rooms*Family Room Is Open To The Kitchen*Kitchen Offers Tile Counters, Island, Two Ovens And Plenty Of Storage*Large Master Bedroom Set Opposite Of Guest Bedrooms*Ceiling Fans, Central Vac And New Furnace*You Will Fall In Love With This One! *"
"Quiet Oasis is waiting for you. Great well taken care of custom home with view of the Valley. Home has deck out back door ,great for bbq with fenced yard for pets and kids with grass area.Lots of windows, home is light and bright.Lots of room to add more buildings, park toys, so much can be done on this property. Property has a couple other buildings on it. Property has two RV or mobile hookups with septic tanks . Electric gate, lots of privacy. Make this a must see. Buy lot next door to have almost 25 acres." "Welcome home to the peace and quiet of Juniper Hills. Well maintained single story home with many amenities. Built in 2005, many of the original records are available. Property has been qualified for Small Pumper status under the Antelope Valley Watermaster. Tile floors in the main part of the house make cleaning easy. Bedrooms are carpeted. Three car garage has plenty of room for a workshop. 2.5 acres is completed fenced with two gates into the property. Views from the large front porch include the Antelope Valley, San Gabriel Wilderness Area and the Devil's Punchbowl. APN #3060-022-035, 2.5 acres is included in the list price for a total of 5 acres." "Beautiful Secluded Retreat on 2.5 acre! 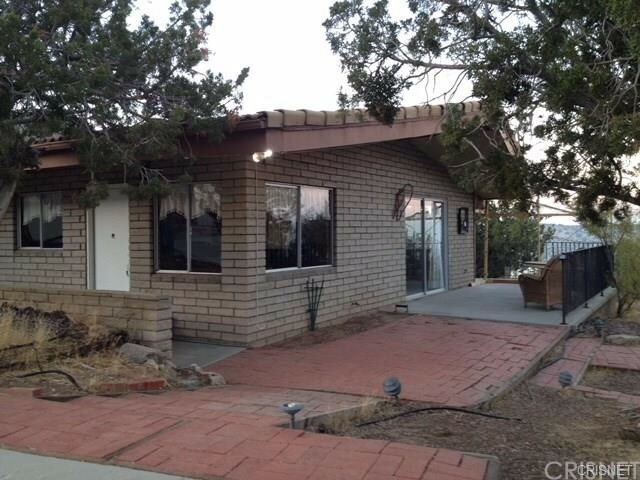 This 2 bed 2 bath high beam ceiling home has serene views of the mountains. Home features a Master bedroom with private patio overlooking the terrains. A gorgeous master bathroom with an in ground spa-bath, double vanity and shower. Wrap around porch for easy outdoor access throughout! Property features a pool with a closed off outdoor entertainment area. Detached 2-car garage that could be used as a guest quarters as there is a separate bathroom. A paved private drive way and a new fence around property perimeter. Property is on Well and septic. Enjoy the clean air of the foothills of Antelope Valley and gentle northern slopes of San Gabriel mountains!!"